Like many audiophiles, my earliest musical memories involve turntables, from a kiddie player (possibly Fischer-Price), to the AudioTechnica my father (who was a Linn Sondek LP12 guy at the time) gave me for my tenth birthday, to coveting the classic Technics SL-1200 (preferably a pair with which to play DJ) in my teens. Eventually, my role at TAS granted me the wonderful opportunity of hearing countless ’tables at shows and in colleagues’ homes, in addition to auditioning some chez moi. The latest and greatest I’ve spent time with thus far is the one under review, the Acoustic Signature Challenger Mk3. Stellar service aside, we’re here to talk about a truly “real world” turntable with a powerful presence of its own. Although the Challenger Mk3 resides in the middle of the Acoustic Signature ’table lineup, in its quality of materials and manufacture, feature set, and price—not to mention playback sonics—it’s far from middling. The Challenger model was first introduced in 2004 and is still one of the company’s bestsellers. It was originally conceived as Acoustic Signature’s smallest turntable of significant mass—that is, the statement-level entry point where Acoustic Signature’s thicker, denser platter was first offered. 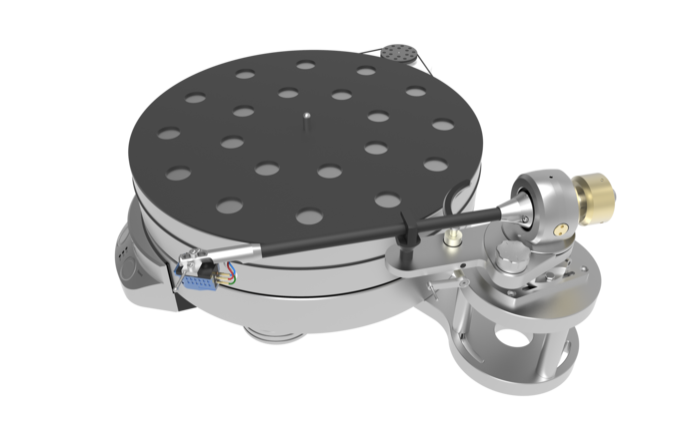 The Mk2 version featured an updated tonearm base and upgraded motor-controller electronics. Among other improvements detailed below, the current Mk3 boasts a European-made synchronous motor with a new Beta DIG digital motor controller for greater speed stability, and therefore better sound quality. This third iteration also offers more flexibility: It can accommodate up to three motors and three tonearms simultaneously. Considering the Challenger’s small size this is remarkable versatility. As with all Acoustic Signature turntables (and tonearms), the manufacturing is meticulous: The Challenger Mk3 is built by hand from parts that are machined in-house; I was able to witness this machining firsthand during a visit to the factory some months ago. Both its high-mass platter and chassis are precision CNC-milled from single, solid pieces of soft aluminum in thicknesses of 50mm and 40mm, respectively. The 10kg platter’s inherently low resonance is further bolstered by a coating of damping material applied to its underside. A black leather platter cover is also included. At the base of the chassis are three, constrained-layer-damped, adjustable feet (simply use a coin to level them). According to the company’s website, the Challenger Mk3’s bearing design focuses on exact fit, extremely low friction, and long-term stability (the bearing is covered by a remarkable 10-year warranty). The base of the bearing is made of a proprietary material called Tidorfolon that’s roller-brushed and paired with a special hardened steel axle. The bearing housing has ultra-tight tolerances and uses carefully matched sinter bronze inserts that are self-lubricating. The results? Very low noise and silky-smooth, seamless performance during playback.